One of the most important features in any successful automated solution is the functionality of the End of Arm Tooling (EOAT). This has inspired the team at Active8 Robots to introduce a range of EOAT to suit any application’s needs. 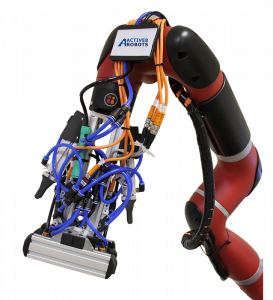 Active8 Robots has designed and created high performance robotic end effectors and gripper systems for turn-key automated solutions. Our EOATs have all been designed with robustness and functionality in mind, and although our standard tooling is suitable for a wide range of applications, we can alter and modify them to fit a client’s specific needs. If an application demands a more complex solution then we can also help by developing and creating a completely new EOAT on site. This need for bespoke tooling is greater than ever before, as more and more applications are non-standard, due to the individuality of each manufacturing process. Luckily, Active8 Robots has the capacity in-house to design and create our own bespoke End of Arm Tooling, which means we can make the exact tooling needed for any specific application, no matter how complex. With a range of 3D printers at our disposal, Active8 Robots can easily create prototype EOAT in order for it to be promptly tested in a proof of concept. Once created the grippers can either be added onto your solution or sold as an individual unit. Our End of Arm Tooling can be supplied as a single unit, without the purchase of a whole application. This means if you already own a robot arm, or have invested in an application from another company, you are still able to buy our end effectors, and be safe in the knowledge that they were designed and developed by one of the most experienced teams around. On top of this all of Active8 Robots’ End Effectors are “Easy Swap” which, combined with the fact that they are suitable for a broad range of industrial and collaborative robots, means that they can undertake a range of tasks and speed up productivity in your workplace. We have the capability to make tools for various robots, and have already worked with many companies to create exactly what they need to increase their productivity. If you think bespoke EOAT is what your automated solution needs then contact Active8 Robots here to discuss what we could do for you.